According to the CNBC survey in 2018, there is an increased growth rate for qualified Economists in all sectors. At the current pace of job growth, there will be a huge demand for people with Economics skill sets in the near future. abstract and identify the problem, qualitative and quantitative analysis, critical thinking, interpersonal skills, information processing skills which indeed gives immense job opportunities. For an Economists position in any public sectors, private sectors and academia, the minimum requirement is to have a bachelor’s degree in Economics, statistics, and mathematics or business studies. Master’s and Doctoral of philosophy in Economics degree is also preferred in top organizations. Some employers also expect applicants to do internships beyond education and analytical skills as a minimum requirement to get employed in an organization. However the more education and experience you have, the easier for you to get employed. 1. Development of conceptual models to predict changes in policy and conditions. Micro Economics focuses on aggregate data for the entire entity. The entity may be countries, businesses, etc. Micro Economics scrutinizes on individuals and their decision making. Both are highly interrelated. Opportunity costs, tradeoffs due to which you make choices due to scarce resources. It describes the next best alternative to select from during the process. Supply and Demand, it decides the price of any goods or services. If the supply is more price becomes less and meanwhile is demand is high, then prices increases. An economist professional must possess logically and analytical thinking along with solid knowledge in statistics and mathematics. The professional should have critical thinking to solve any complex problems and designs policy. Economist also studies history trends and use them for forecasts. Proficient communication skill is mandatory for any Economists to portray their analysis of various problems and solutions. Detail oriented, Economist must have detailed interpretation. Precise data analysis is required to ensure accuracy in all their findings. Ability to use the analytical tools of Economics in problem-solving. Expertise in the use of computers for the analysis of data. Knowledge in the various applied area of Economics. The above-mentioned skills related to both Economics and other skills are necessary for any individual before you search for a career in Economics. Economics is the most important field in any sector. There are many opportunities for an Economist in the private and public sectors. They play a vital role in defining market policies and transforming the market as per the new trend. Thanks to inflation and deflation, market fluctuation, change in trends and so on which paved the way for the job growth for any individual who chooses their career in Economics. Hence the role of Economist is a never-ending and has an emerging future. It is important for any organization it may be either private or public to hire An economist in their concern to change existing and derive new policies as per government norms, research, collect and analyze data to monitor economic trends. There is huge scope for a career in Economics in any given period. 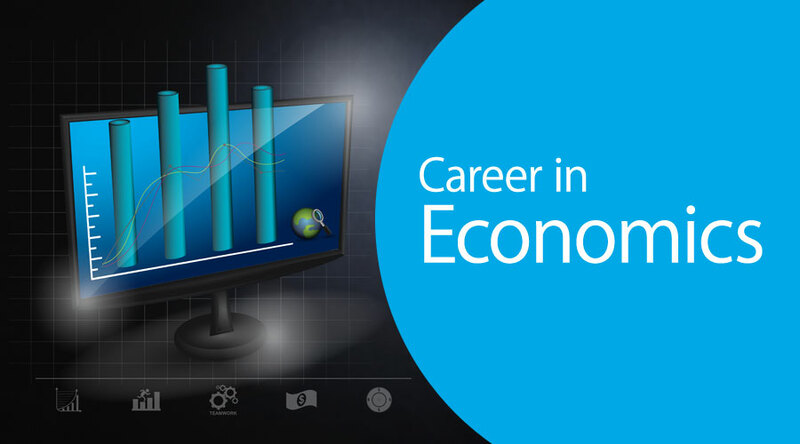 The above mentioned are some career options which you have for Economics. Below table shows the average salary of different economist positions per annum. The employment of an economist is projected to see a growth of 25% from 2019 to 2029, compared to all other occupations. Many organizations rely on economist for economic analysis, quantitative ways to analyze and to forecast business, sales and other economic trends. As the complexity of the global economy grows the demand for Economists grow eventually in the private sector, specifically in management, scientific and other professional consulting services. It’s hard to deny that an economist is the most significant career option for any individual. As far as the economy is considered it’s always volatile. The change in the economy is agile which always paves a way for Economists to redefine the industry policies and expertise the solution for a problem. The economy being a backbone for many businesses, countries, governments, and society as a whole, the role for Economists is important in any sector and is a never-ending one. As far as the future is concerned, an economist will exist in this universe what may come to overcome scarce resources by the futuristic approach. The economy is embedded in all industries either private or public and it occupies the better position in an organization to forecasts on a wide variety issues such as inflation, interest and exchange rates, taxes and so on. I strongly believe amidst all other occupations Economists have a huge role to play in redefining the countries GDP and growth of an organization. Hence career in Economics is here to stay and to create a big impact in the future too.